Whether you work or stay at home full time, making time to read is important, and when you do secure those precious moments, you'll want to fill them with something worthwhile. Something that will make you think, but that also immerses you in a world so detailed and vivid that you take a trip far away each time you flip the pages. And with the advent of ebooks and amazon.com, for the cost of a cheeseburger at McDonald's you have access to millions of such books with the click of a button. Choose wisely. You'll want something more satisfying than that cheeseburger would have been, after all. 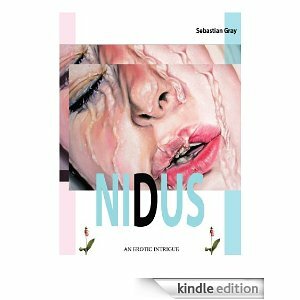 Sebastian Gray doesn't mince words or shy away from difficult ethical questions in his book, Nidus. The perfect mix between a fairy tale and a twisted noir, Nidus is a Cinderella story of the most evocative kind. "A smoothly compelling tale of speculative eroticism, NIDUS is set in the summertime playground of Newport, Rhode Island, depicted here as a sensuously intoxicating place where the lascivious comes as if coated in tangerine-flavored candy, where titillation floats everywhere in the pink air of summer evenings. It is a Newport where it seems natural for just about every alluring person to be caught up in blithe if mysterious debaucheries. Among them are Helana, the sleek, hitherto serene, mature trophy wife of an aging yacht owner, and Terry, a poor, loose and often ill-used unwed young mother. Though ostensibly from opposite sides of the tracks, Helana and Terri come to be erotically manipulated by the same man, Lathian Kometes. A journalist who specializes in society exposés for glossy magazines, Lathian is in town to cover the wedding of the season. With what idle time he has on his hands, Lathian seems casually intent on a more intimate and experimental form of exposé, using one woman to expose to the other what she would keep concealed from herself. Is he doing this merely for the sake of a Pan-like amusement? Is he what he appears to portray himself as, some wry apostle of eros? Or is he more sinister, a modern slave-hunter of sorts?" The relationships are sordid and surreal but strike a closer chord with real-life strife than one would like to admit. The use of sexual exploration brings the reader to new heights, but underneath those tones lie struggles with identity, personality and control in all aspects of life. The subtle themes reach out to all audiences, hidden well within the fantastical and imaginative. If you've got a dollar to spend (or if you're a Prime member, get it for free), it's worth the download. You'll be engrossed from start to finish. Plus, I know the author and they're brilliant!